Eat The Next Sriracha? 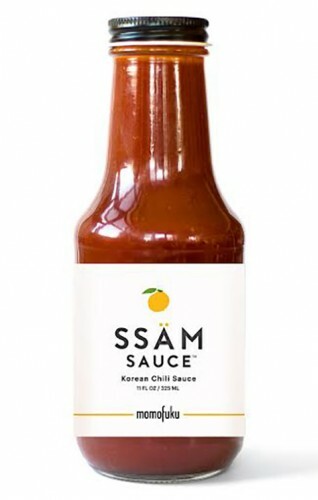 Momofuku Now Bottling Korean "Ssäm Sauce"
The Next Sriracha? Momofuku Now Bottling Korean "Ssäm Sauce"
Fall back, Heinz sriracha ketchup. Earlier this week, we got you all excited over Heinz’s new sriracha ketchup flavor. We’d argue that the imminent debut of Momofuku’s bottled Ssäm Sauce, a Korean chili sauce made in-house by the restaurant, is something to get even more amped about. No word yet on whether the chili sauce is a replica of the one they serve at Momofuku restaurants to accompany Chang’s famous bo ssam (only time will tell. This isn’t Momofuku’s first bottled condiment. Momofuku Lab—which has merged with Kaizen Trading Co., the Willy Wonka factory of fermentation and umami—makes two products for chefs: hozon, a Japanese miso-like product made from nuts, seeds, and legumes; and bonji, Kaizen’s version of soy sauce fermented from local Northeastern grains. More information on the sauce will be posted to ssamsauce.momofuku.com as it becomes available, and we’ll be sure to post any updates on the sauce’s availability.